Have you ever been asked to do something that you knew you could probably handle but doing it would be a little uncomfortable? This happened to me yesterday. There was a basketball tournament for 7th and 8th grade boys in our town. It was a fundraiser for my daughters’ dance team and they needed volunteers to help. No problem, I thought. Take tickets, sell a few candy bars. I could do that. Unfortunately, those positions were filled. 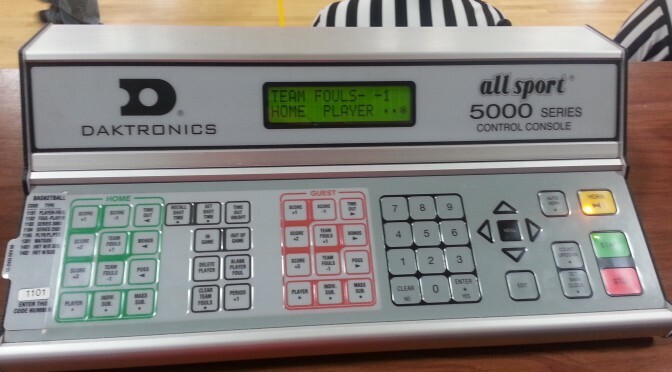 What they really needed was someone to help referee or run the scoreboard. Since my basketball knowledge and experience stopped in 8th grade reffing was out. That left the scoreboard. Something I figured I could handle, but still it made me nervous. What if I messed up? I’ve been to kid’s sporting events before and know how “intense” some parents can be. I’m happy to say I made it through 3 games without messing things up. I was fortunate to have some very knowledgeable people who could help out when my brain couldn’t keep up with the action. Thank goodness it was only middle schoolers playing. Keeping up with a really fast paced game would have been tricky for me! I’m glad I didn’t let my fear of messing up prevent me from helping out. In the end everything turned out all right. I met a nice grandfather of one of my daughter’s dance friends. I showed my daughters that you should not be afraid to try new things even if they might make you uncomfortable. And the tournament raised some money to help fund the dance efforts for my daughters and their friends. It was a winning day!